Paul, Neil and Ian nipped over to Essex this morning. It was Baynesy's first LVRC race having recently graduated to the club of a 'certain age'. Following one of Neil's long rambling monologues about how great, relaxed, civilised and friendly an LVRC race was compared to the BC variety, the break blasted away after half a lap. And stayed away for the duration. Fortunately, Neil had taken no notice of his own 'overview' and he was alert as Vince Divine, last year's winner, took off. This was quite an achievement following a rather late night involving red wine, cheese and easter eggs, but he held on and put in some big efforts with half a lap to go when Vince put in a pretty nasty attack: "I couldn't go with him though," he admitted. Rather than sit in and wait for the sprint, he seemingly decided to burn himself out a bit more: "I suppose I just wanted to see what I could manage," but the efforts were fruitless. Leading out the sprint for 2nd place, he launched a touch early, but took 4th. Paul, meanwhile, was playing a typically canny game and, having saved himself, took the bunch sprint and 9th place. Ian was disappointed last week at Hog Hill, having had to pull out after 5 laps due to gear trouble. Unfortunately, the ill fortune continued today with a pinch flat on one of the many potholes on an otherwise good circuit. "Surely, I must be due some good luck next week," he sighed. Having been beaten by Richard Wood at the Sid Latchford TT in March, Ross and Luke returned to more familiar roads this morning. With clear but chilly conditions, they hit back to take 3rd and 4th respectively; tucked just in in front of Richard. Tony came in a bit further down, but was grateful for the dry weather after his slippery corner incident in Essex a couple of weeks ago. "The form seems to be coming," said Ross. "No doubt that week training in Spain last week helped." 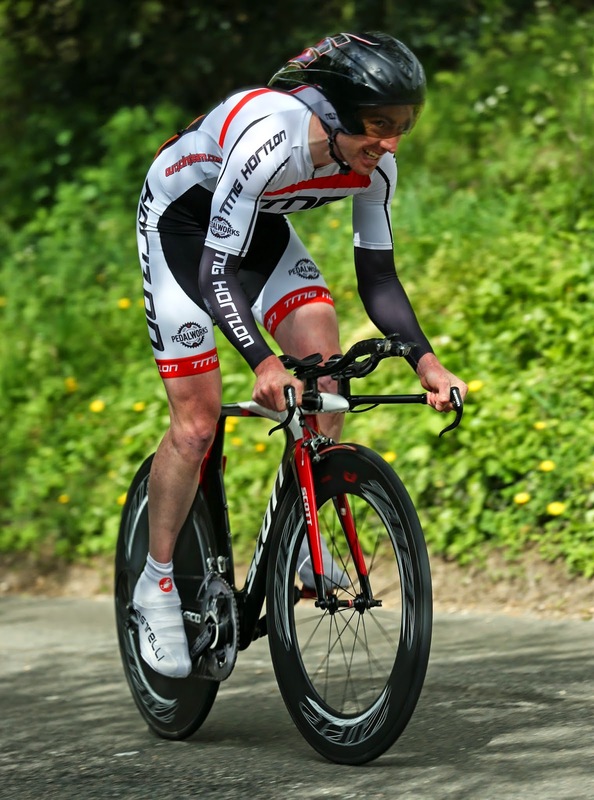 Local Strongmen Roy Chamberlain and Richard Wood crashed the party for Ross & Luke but that still meant that that Ross made it to the podium with 45:19, and with Neil making a mini comeback on his 12 year old TT bike, the trio took the team prize by a comfortable margin.